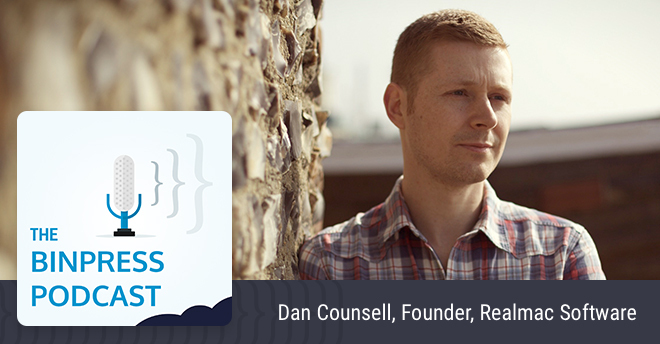 On this episode we talk with Dan Counsell, founder of Realmac Software, an award winning independent Mac and iOS development studio. They’re the folks responsible for app such as Clear on iOS, and RapidWeaver, Ember and Typed on Mac. Dan covers why bundle sales are useful, why you shouldn’t rely only on app stores, what can make a software company sustainable, and much, much more. Alexis: Dan, thanks for taking time out of your busy schedule to come on the podcast. Dan: You’re welcome, thanks for inviting me. Alexis: Before we get into the more recent stuff with Realmac Software, let’s do a quick history lesson. How did you get started programming? Dan: Well I’ve always had an interest in computers growing up and I was lucky enough that my dad ran a print shop. He got into Macs very early on, so I grew up having a Mac Classic and all the old iterations of Power Macs at home, so I was very lucky from that perspective. I never got into PCs and stuff like that, so I feel pretty fortunate. Yeah, I’m a die-hard Mac user. Anyway, my dad brought home a Mac Plus I think it was, and we had HyperCard on there, and I was just tinkering around that. At the time, I must’ve only been 10 or 11 or 12 – around that age. I was playing with HyperCard, building simple games and little scripts. From there, I got interested in that and then went on to building websites. I got a little bit interested in PHP, and then eventually ended up using REALbasic. By this time, this was on Mac OS 9, and that’s really when I released my first product. Again, I had a full-time job and this was just a hobby. That’s really what set me off on this road of developing software and that must have been around 1998 or something, maybe; 1999 when I released my first app. So a long time ago now. Alexis: How did your first app lead into Realmac? Was it a very quick transition, or was it a bit more patient transition? Dan: Well the company wasn’t founded until 2002, and that’s when I finally quit. I was working in London at the time and I finally quit my job there and went full-time with this. By that time, I had a couple of apps out – I think Button Builder and NavBar Builder – and it was just making enough that it matched my salary, except by quitting my full-time job I then essentially cut my income in half. It was enough to be sustainable and luckily, I was living with my girlfriend at the time and she had a full-time job, so it was enough to cover the mortgage and everything, so we were okay and I decided to give it a go. Alexis: Alright. Now that we’re somewhat up-to-date on how you got to Realmac, you have had many successful products – RapidWeaver being among them; Clear for iOS; Ember, which used to be called LittleSnapper, which I still have running on my Mac –. Dan: Oh, you should upgrade! Alexis: I should! I should! It’s just done what I’ve needed it to and I’ve been dragging my feet, and for that, I am ashamed [chuckling]. And Typed, which is more recent. How do you decide what products are worth building? As a company, we’ve always focused on stuff that we want to use, because otherwise, you end up building a product for other people and not for yourselves. If you’re not using it every day and you’re not passionate about it, then it wanes, and that shows too in the product. Because they’re products that we wanted and want to use, I think that helps add to the level of polish. All the small bugs and rough edges that users would see, we would see those every day using it, so it’s in our interests as well to make it as polished as possible. Alexis: And those are often the most annoying bugs – everything works perfectly except for these few things that get in the way that just sours the whole experience. Dan: Yeah, it’s always just been stuff that we want to build for our own use. Alexis: Alright. When it comes to spreading the word for software, how do you go about that? Before we dive into that, I have to commend you on your blogging because your blog is very interesting. For developers, I would assume it’s very useful because you open up a lot of stuff – everything from revenue to your tactics on assembling up PR lists and all this. Dan: I only put out about a post a month, because I’m not the best writer in the world and it takes me a while, and obviously I’m trying to run a company, so the blogging side of things is a bit of a sideline. It’s hard to find good quality information that’s relevant to people that are actually doing it. I know I would’ve found the stuff I’ve written useful when I started 12 years ago, and it takes years and years to learn this stuff. I’ve learned a lot of it through mistakes and trial and error, and a lot from peers as well, from just chatting with fellow developers and people in marketing. It’s that body of knowledge – it takes a long time to learn all that stuff. I do have a lot to share, which is why I keep writing posts, but it just takes time, really. But going back to your original question, how do we spread the word about our software? We don’t tend to do paid advertising. We’ve done a bit of it in the past throughout the years, but it’s never really worked that well. We’ve never seen great returns on that. Alexis: Neither has Keith over at Literature and Latte. Dan: Yeah. Maybe it used to work better, but – I don’t know. Sometimes it’s hard to quantify it because you could say more people are getting to know about your products and sure, they might not buy them, but maybe in the future they’ll remember you. Then it becomes even harder to quantify. We haven’t found it to be that good. We tend to focus on our products and we try and release very often. That definitely helps with word-of-mouth, because also a few users are getting lots of updates in there, then they’re pleased about that and they tell people about that and they tweet about it, et cetera. But also, because we’re very fortunate to get mentioned in the press – a fair amount, probably because we have quite a few products. If there’s an article about building websites on the Mac –. Alexis: Oh yeah, RapidWeaver will be there. Dan: Yes! And you really can’t put a price on that kind of stuff. You often only get that type of marketing from being around for a while, and getting people to know your name and know your software, so that’s part a little bit of a chicken and egg. But I think it comes back to just focusing and continuing to build software and just keep putting it out there, keep doing it. When you release your first product, it’s pretty hard and no one’s heard of you and no one wants to know about you, generally. The more you do it, you start to build up a bit more reputation; you start getting mentioned and I think a lot of people give up before they even get to that point, because it can be very frustrating. I think that’s incredibly important for us. I think that’s where a lot of our traffic comes from – it’s reviews and being mentioned, and also turning up in Google searches. We get a little bit of traffic that way. Alexis: Now I curious about press mentions, especially ones that happen after launch. For example, a website writes about web development on the Mac, and of course they plug RapidWeaver. What is that response that you see from that? I assume that lots of developers are like, “Oh man, if I can only get a mention of my app on x website, I’ll be set. This will be great.” I have a suspicion that it might not be that impactful. Dan: Again, it depends on what site it’s on, how much traction the site gets. Also, it might only be a couple of copies, but I get these things add up, don’t they? People are still looking at those articles even years down the line; one article is not enough. It needs that snowball effect – you need to be mentioned in a lot of places over time, and then –. Dan: In the book, I’m trying to go through the whole process, and I think one of the most important things is to start hyping your app before it’s launched to start getting the word out and start to build a following of people that are interested to hear about your app. One of the worst things you can do is spend six months, a year, locked away in secret, building this app, and then just come out one day and put it on the App Store and wonder why no one downloads it and no one really cares about it. That’s what a lot of developers do – they spend all this time building it and then they think once it’s finished and once it’s released, it’ll suddenly take off. That’s simply not the case. I think one of the most important things is to announce what you’re building – have a blog, talk about what you’re building, behind-the-scenes looks at the app in development and try and build a following of people who want to follow along and learn about the app as it’s being built. That’s one of the best things you can do. Alexis: When it comes to developing for the Mac and for iOS, obviously there are a lot of differences, but what are some of the important things people should really consider when they’re getting into either? Dan: From a marketing perspective? Alexis: Any perspective, really, in terms of what might trip people up. I guess also from marketing and sales, yeah. Dan: I don’t know. I tend to market both platforms the same, really. Maybe pricing – it’s very different on iOS still, I think. Alexis: Speaking of pricing, what have you learned about pricing over the years? Dan: On iOS, probably the people don’t want to pay for software anymore. People expect everything to be free, I think. It’s very funny, I think people are finding it increasingly hard in iOS to make decent money from paid or free software, or freemium – however you want to do it. If you speak to anyone, people generally don’t want to pay for software for their phone anymore. It was very different when the iPhone first launched and there was only paid apps. Also, all the apps were new and people wanted to try the new apps. Now, there’s a slight lack of innovation, maybe. There are a lot of photography apps out there, which is a really tough market, but they’re all pretty much the same, but slightly different. Alexis: I was staying at an Airbnb place last week and I recommended TextExpander on iOS to somebody, and they pulled it up and they were like, “Oh, $1.99!” It’s as if they had been stuck in the heart with a giant knife. Dan: Yeah. I think within the tech community we’re in a little bit of a bubble or quite a bubble, but we’re happy to pay for software because we know much has gone into building it and how useful it actually is. We can tell the difference between the good quality stuff that gets updated regularly as opposed to the one-off apps that get put out there and then forgotten about. Normal people don’t know about that stuff and generally do not care either. If it does the job, then they’re happy with it, even if it looks really bad. They don’t care; it’s free and then they just put up with it. IOS is pretty hard, but it’s obviously not –. Dan: Yeah, there’s money on iOS. I think for paid apps, which is something my book focuses on, is the launch. With a paid app, that is where you can get a lion’s share of the money and revenue upfront that will pay for all the development you’ve put in. Hopefully, it will do better after that, but at least if you have a really good launch, you can make back your initial investment, and then some to keep going to build your next app and do it again. One of the things that a lot of people don’t think about – they think, “Oh, I want to launch my app” because towards the end you’re getting a little bit itchy feet. Then you really want to launch the app and just get it out there, because you’ve been spending so long on it, you just want to get it out there – just ship it. Alexis: It’s like a diver on a diving board – perfect all the way then at the very end they get nervous and they screw up. Dan: Yes, and people are just eager to ship it and they don’t spend the time to have a really big launch. They think they can build up momentum after it ships, and try and push it up the charts and deal with the marketing after it shipped. If you leave it until after it’s shipped, it’s definitely too late. By then, your app is already out and no one wants to hear about an app that’s already released. Alexis: Right, it’s old news. Dan: Yeah. Everyone wants to hear about the new app, the next thing. They’re waiting for the app that’s not quite released it, but everyone wants it because they’ve seen all of the screenshots and videos and they can’t wait for it. They don’t want to hear about your app that’s already released. I think a lot of people make that mistake. Alexis: What have you learned about pricing on the Mac? Dan: Pricing on the Mac’s pretty good. I think especially for professional apps, people are willing to still pay for software, which is a good thing. If you are a developer trying to build a sustainable business, the Mac is a good place to be. If possible, build for both platforms – for iOS and Mac. The apps on the Mac are higher priced, which means you obviously have to sell a lot less of them, and there’s less competition on the Mac as well. If you can produce a really good, polished app that helps people get something done – for professionals, that will help them do their job better – then people are willing to pay for it. Alexis: A chunk of change, yeah. Dan: Yeah, you just couldn’t do that on iOS. We found the Mac to be pretty good. Ember’s $50 and Typed is currently around $20-25. These prices are more sustainable, and the apps would be able to help people do their jobs. They’re not gimmicky, throwaway apps. They’re apps that will let people get stuff done. Alexis: Have you ever course corrected on a price? “Man, I’ve charged too little” or “I’ve charged too much” and you have to adjust? Dan: Yes. I mean, we play around with pricing a fair amount. I know, on iOS, one of the mistakes I made was when we launched Analog for iOS, which was a camera app, back a few years ago. We set it up for a big launched and we were really focused and we wanted to get it into the top charts, obviously, as you do, and we wanted it to go to number one. We really focused on that and we weren’t thinking so much about revenue; it was really about pushing it up the charts and making sure it got to number one and all that. We got the request from Apple for artwork and things for it to be featured, and so that was a really good sign. We talked about pricing a lot, and in the end, we launched 99 cents. We didn’t quite make it to number one; I think it got to 2 or 3 in the overall charts, which is really good. I can’t complain about that. I’m not complaining. But I think 99 cents was too low, because even if we would have launched at $1.99 –. Alexis: You would have doubled your –. Dan: Yeah, because people were really hyped for it and people were going to buy it anyway, and it’s not that much more. Maybe we wouldn’t have doubled it – I don’t know, but it would have been a considerable amount more. I think in the first couple of days, or in the first week, it made 70,000 USD. I think if we would have been $1.99, we would have easily made over 100K in the first week. I think that’s a good case study in how, if you price something wrong, how much money you can leave on the table and it can affect your business and et cetera, et cetera. That was a very valuable lesson there. Alexis: SO when it comes to paid upgrades, that’s something that you’ve, I believe, started doing with RapidWeaver 6? Dan: Yes. We’ve always done paid upgrades on the Mac since we had RapidWeaver 1, 2, 3, 4, 5 and they’ve all been paid upgrades. Alexis: What can you tell us about paid upgrades? Are they worth it? Spoiler alert – the graphs on your blog say yes. Dan: [Chuckles] Yes, they are, yes. Of course, and I think it’s one of the best ways to run a sustainable business on the Mac. You can go along and you can keep updating the app for free, and you can keep getting new customers, because there’s a never-ending stream of new customers, but it’s very hard. You’ll never make as much money as you do from when you launch an app, because the launch revenue –. If you speak to any developer – I know you’ve spoken to quite a few – the launch revenue is often the point in which you’ll get the most amount of revenue in the shortest time. Alexis: Mm-hm, and often in the lifetime of the app. Dan: Yes, sometimes. Or it can take you a few years to get what the same revenue as you got in that space of two weeks. It’s very hard to continue developing the software and putting features in and justifying having x number of people working on it when the revenue is staying fairly flat. But if you have the chance of reliving that spike of revenue from when you launched the app, then that’s great for the business because you can plow more back into the app. Paid upgrades on the Mac are a great way to do that. The RapidWeaver 6 launch, that was great for us as a company. It did a lot better than we expected and the revenue was great from the upgrade and users were happy, because they want to see new versions and they’re happy to pay for them on the Mac, which is very different on iOS. Why did you think they were detrimental and why have you started warming up to them again? Dan: First of all, I never mind admitting I’m wrong or coming out and saying, “That was a wrong decision,” because we all make poor decisions. The decisions we do make are in the best intentions. Alexis: And with the best information that we had at the time. Dan: Yeah, and when we think it’s for the right reasons, we think it’s going to work. Your listeners probably have not read the blog posts; they’re kind of spread out on the Realmac blog and I think I do talk about it again on my own blog. Essentially, we always used to do the bundles and put our Mac apps in bundles, and then over time, we talked about it a lot internally and we felt like perhaps it wasn’t the fairest thing for users who had paid full price for the app and actually is detrimental to the marketing of your app, saying, “All these apps are now cheap; it’s just in a bundle with a bunch of other apps.” That doesn’t reflect very well on the app. So we made a decision, we came out and we said, “You know what, we’re going to start bundles, and this is the price of our software. If you want to buy it, you have to pay full price and will never be in bundles again.” That was the idea. We figured because people know this and our users know this and customers would hopefully know this, then we’d actually see an uptake in sales just generally and it would cover the lost revenue from doing bundles. We stuck with it for a long time and it didn’t pan out that way. We essentially had a bit of spike in software sales when we announced it and no noticeable difference going forward. Revenue stayed the same for the company apart from we lost out on bundles, so at the year end, we could’ve made more money as a company. When you look at the figures and it’s like, we want to keep running this business and we don’t want to go out of business and we have staff to pay and an office. We need to earn money to pay everyone. It was a tough call, and just looking at it, we lost out on tens of thousands of dollars, if not possibly hundreds of thousands, or at least a hundred thousand, I could guess, at any year of revenue. That’s quite a fair amount of change, so when we look back at everything, this was probably not the right decision especially for a company if we want to stay in business. Also, we made a reversal and we started going back into bundles and putting our apps in bundles and we haven’t had any complaints from users [chuckling]. Maybe it was something we put on ourselves when we thought users would be unhappy about it, but I think it’s just so commonplace now. That’s what people expect and they often wait for apps they want to buy to be in bundles, and they might not buy your app otherwise. It was a bit of a reversal. Alexis: Just to provide a bit of an emotional uplift here, I think it was a good thing to try because otherwise, you would have kept doing these whole bundle sales thinking, “Oh God, I’m losing out on revenue” or “I’m shortchanging my customers.” Now that you actually have proof, well, you can go forward confidently. Dan: Yeah, so I would definitely recommend people take part in bundles. Also if you’re a Mac developer, this is one of the benefits of – do put your app in the Mac App Store, but also sell directly because if you don’t have a direct version, then you can’t take advantage of putting your apps in bundles and again, you’re losing out on extra revenue. Alexis: Now before we dive into the benefits of selling directly, a question about bundles. Is there something to frequency? Should I go for every bundle I can get into, or should I carefully choose which ones that I put my software in. Dan: If it’s a very low-quality bundle then you probably don’t want to put your app in it, and if it’s not going to hit a very big audience, then the return is not going to be that great. Also, a lot of bundles stipulate that you can’t be in any other bundles during that time, and some of them don’t want you to put your app in a bundle for six weeks after it’s finished or something like that. Pick and choose carefully, but if you’ve got awful products, then it’s even better because then you can kind of just go through them and space them out evenly, but you can pretty much always have an app in a bundle. Pick and choose, but I wouldn’t worry too much about how often your app is in a bundle. Alexis: Going back to the benefits of selling directly, some of the things that the Mac App Store will hold me back from doing or – excuse me. Sorry, I’m recovering from a cold which is tripping me up. What are some of the benefits from selling directly versus the Mac App Store or any other App Store? Dan: I think the number one benefit from selling directly is actually knowing who your customer is. I think that’s one of the most frustrating things about the App Store in general, is Apple keeps all that information and you never know if people buy your app. You obviously get the revenue, but you never know who they are, and there’s that kind of disconnect. If you’re a small independent developer, it’s really important that if you have an app and you sell it and that’s great, and then you want to do version two or you have another app that you think your customers may like, then on the Mac App Store you can’t contact those customers to tell them. It’s like, “Hey, you might be interested in this other app that will help you build websites or whatever. Check this out; it might interest you, because you bought from us before. Here’s 20% off because you’re already a customer.” The Mac App Store provides no way of doing that. On the Mac App Store, you have no way of doing that, and the longer you’re building software and you’re running a business, the more important that becomes. Alexis: Speaking of running the ship, you’re out here on your own vessel, on the open ocean. How do you stay focused on both the short and the long-term strategy and goals? How do you make sure that you’re working on the right thing? Dan: I mean, there’s a company – we don’t really have any grand vision as such. We just want to build good quality software that people like and that we want to use. We track the software, we have goals and milestones for the product, and we have such a long runway with them as in we know how many features we want to build into them; we just don’t have the time to do it. We’re working as fast as we can and we’re doing releases for all of them, and there’s just so much we want to do. We’re just focused on really building and improving the apps we have. We tend to be pretty fluid; we’ll see what comes up. There’s no long-term strategy, really. Does that sound bad? Maybe that sounds bad. Alexis: No, no! I think it’s a good thing because it shows that you’re focused on the software itself. This is the thing that matters after all, it’s what the company’s built around. I think it also goes back to, again, to bring up another one of your blog posts, the difference between the whole venture capital “Yeah I’m starting this company to build this app because I think there’s a big market here” or “I want to build this app because I want it to exist in the world and I would use it.” I think it speaks to the dedication to that kind of mission. Dan: Yeah. I mean, I got into this as a hobby because that’s what I enjoyed doing – and it still is. I don’t feel like I go to work; I’m very fortunate. I think a lot of people in the tech industry are the same, especially indies running their own thing. It never feels like work, and I think as soon as you take venture capital or you’re answering to someone else who’s trying to really push you to flip the company and make massive returns, the pressure mounts up and you’re no longer in charge of your own destiny, of your own pace. We’re very focused on what we do and we want to build the best software, but we don’t want to do that to the detriment of everyone working at Realmac. We keep sensible hours; we don’t have a startup mentality. Alexis: 9AM to 9PM. Sensible hours. Dan: Yeah, it’s all pretty laid back and we enjoy what we do. I’d always wanted to keep it that way. Alexis: Again, going back to the blog – the blog is a very deep well, Da [chuckling]. You’ve written about the difference between building an app and building a business. You mentioned a couple of minutes ago that you have to remember that you’re building a business, and sometimes it’s gone from a hobby to a business. I guess what I’m asking here is how do you set these expectations and how does that affect you, or how could that affect folks when it’s their hobby but they want to turn it into a business or that kind of thing? Dan: I think that post was a lot about thinking about what you’re actually building, and I think it has a fair amount to do with iOS and throwaway apps. If you’re trying to build a business, you really need to – you’re doing it as a hobby and you’re trying to move into a business – think about trying to build an app that has longevity to it, that people could use for years to come and that people would find useful and can use to help them get stuff done, to help them be creative or build something or make something. Don’t build a throwaway app or some gimmicky app that you think will make you a quick bit of cash, because you can’t keep doing that. It takes a lot of time and energy to build apps, and it’s really stressful – it can be – to get them shipped. If you’re constantly having to repeat that process and start again from scratch, to try building all these apps – because I know some iOS developers have tens of apps on the App Store and just keep churning them out. That’s really hard and really taxing. You should really focus on building some good, solid apps that will be useful for years to come and you can earn revenue from them for years to come. I think RapidWeaver is a good example of that, because it’s been around for 10, 12 years. It started off very simply and it has grown over time, and it’s been our biggest product – there’s no question about that. Over those years, it’s surpassed Clear many times in revenue, although Clear – everyone knows it. It’s funny and people assume that’s where a lot of our revenue comes from now. Most of our revenue’s made on the Mac, and RapidWeaver is the main contributor to that, I’d say. Alexis: Now I have to ask about scale when you talk about Clear, because that’s what – about 2.5 million users? How does that change things, if at all? Dan: Clear has been phenomenal for us; it kind of helped us get our name out there even more so. We obviously had a lot of recognition for Clear. I think one of the most important things for us is it helped us build even better relationships with people at Apple, which is very important to have if you’re an independent developer, if you can manage to get a contact at Apple. It really does help when it comes to launching your app. That’s been one of the biggest things. Also from the press aspect as well. Obviously, people – especially in the press and tech scene people have heard of Clear. If we haven’t dealt with them before, we can say, “We’re Realmac software; we’ve built this, this and this.” And the chances are they know about one of those apps, especially if they’re just iOS-focused then they’ll have no doubt heard of Clear. It does help open up doors. Alexis: What about in terms of development? Dan: I suppose Clear can be quite stressful, being on iOS, because people expect all the latest things. Especially when we push out an update – because most people have auto-update on now, or a lot of people do – you push out an update for Clear and then overnight, it goes to over half a million people. If you ship a bug –. Dan: Yeah, it can be a little bit nerve-wracking. We do test a lot in-house, obviously and we have beta testers and things and, touch wood, nothing ever major has happened, but if you pushed out an update and it wiped people’s to-do lists, half a million of people, overnight – yeah, that’s a nightmare scenario. I think there is that aspect of stress, but at the same time, it’s amazing to know that that many people use a bit of software we as a team have created. Alexis: Speaking of stress, how do you manage burnout? Dan: I don’t know [chuckles]. I’m generally pretty laid back, so I’d say I don’t really get burnout. I mean, I do have times when I’m stressed; if we’re releasing a lot of products, it can be a bit stressful because there’s so much to get done in a short amount of time, but as I’ve said before, as a company, we keep pretty good hours. It’s kind of 9 to 5. Sure, most of us work a little bit longer or we’ll work a bit in the evening, checking on things on the weekend – we’re not doing those crazy hours where we’re working first thing in the morning to the wee hours of the night. People in tech get burnout because they’re doing that, and I think it’s just expected in the startup scene. That’s what a lot of people do, but it’s totally not good for you, so I tried to avoid that. Is burnout and stress the same thing? I don’t know. Alexis: No, no. I wouldn’t say so. Dan: No? I never really get burnout then. I can be stressed. Alexis: There can be some overlap, I think. Dan: Yeah, I can get stressed at times just from when we we’re launching a lot of products, but after the products are out the door and everything’s gone well, then it’s all good. It would be for a couple of weeks, and then right up to launch when there’s a lot to do – that can kind of be –. I think it’s especially with running a business as well, doing all the day-to-day stuff and managing finances, managing people – all the things that crop up. It can be a lot to manage, but it’s not like we have major releases all the time, so I don’t suffer it too often. Alexis: Sometimes I ask people how they keep themselves organized, but I think that would be too easy for a question because you’d probably answer Clear [chuckling]. Dan: Yes, I do use Clear and I do keep things very simple. I don’t have lists upon lists upon lists. I have a few general lists for Realmac and then personal – stuff like that. Managing the software is – they’re all tickets; it’s all online and things, so it keeps it separate. Yeah, Clear is a good way to manage stuff, I would say that. Alexis: If this was a video podcast, you’d look straight into the camera and give us a thumbs up. Alexis: And maybe a wink and tooth glint in post-production. What’s one mistake you’d rather not repeat in your Realmac journey? Dan: Probably a couple of things. One is, I already talked about the pricing. Pricing mistakes are obviously costly. But the thing is, you often don’t know you’ve made a mistake until after you’ve done it. Dan: Pricing is so hard; you can launch something and no one will complain about the price, and you are expecting a few complaints. And then you get there, “We should have priced it higher, because people are obviously seeing the value in it and think it’s worth more, so we’re probably not charging enough for it.” I was going to say, yeah, the pricing thing. I think hiring’s pretty tough. I would like to make sure I’d continue to hire the right people. Hiring is very tricky; I’d rather not make a mistake where we hire someone who’s isn’t right for the position. Alexis: What are some of the considerations you take when you’re considering hiring somebody? How do you know what position you have to hire for? I think, as a team, you know when –. Alexis: Some of the seams are getting tight. Dan: Yeah, when you’re overworked in a certain area or something’s not getting done or isn’t getting enough attention, so it becomes quite obvious where we’re lacking. On the development side of things, it’s always a very tricky balance to get because it’d be great to hire another ten developers and then the software would progress a lot faster, but at that level, the business wouldn’t be sustainable, so it’s getting that balance. Alexis: On the flip side, what’s one decision that you’re particularly proud of? There can be several. Dan: I’m not a particularly proud person, I would say. I’m very, very humble and I’m very thankful – I feel very lucky, and I put everything down to a lot of luck, really. That was lucky we did that [chuckling]. I suppose I’m glad we made that decision to go ahead and try and build something for iOS. Who knows what we would have done otherwise? Things would have been very different. I’m pleased we decided to have a go on iOS and just see what we could do. I think back then we were definitely focused on the Mac. I mean, we still are, but it was kind of a “We should probably do something on iOS.” So I’m glad we gave it a chance and did something. Dan: Yeah. I don’t have any business cards anymore. Alexis: [Chuckles] This is 2015! What are you talking about, Alexis? Dan: Yeah, but if I did, I could put that on there. Alexis: Second to the last question here, I know you probably use Xcode as your IDE, as any good Mac developer would – and also, what other choice do you have – but what’s your text editor of choice for code otherwise? Dan: Sublime is pretty good. TextMate, still – I kind of like TextMate; I think that’s a good editor. Alexis: Alright, so another vote for the Sublime Text and TextMate column. Dan: Yeah, they’re both good choices. Honestly, development-wise, I don’t really do much anymore. I’m more on the design side of things now, because that’s where my strengths are. I dabble on the web side of things. For developing apps, I’m more design, UI, UX stuff these days. Design has always been my strong point and now I hire people that are just way better than me. It’s embarrassing, sorry. I guess that’s one of the things, knowing when you can get someone else to do it better than yourself. It’s more time and cost-efficient than me trying to do it a long time ago. Alexis: One last question here. Is there anything that I didn’t ask that I should have, or any kinds of parting wisdom that you would like to impart to our listeners? We thought about it for a long time before crowdfunding, and one of the things that I kept coming back to is that crowdfunding is not just a way to raise money; I think it’s almost become a marketing tool now and also a validation for your product. Dan: We built Typed for the Mac, which is a Markdown Editor, and we always talked about building an online web development environment, kind of like the next generation of RapidWeaver, and we talked about this a lot over the last five or so years. It was a very risky move for us to build something on the web because it’s not something we’d done before, really – not as a –. Alexis: Production kind of product. That was the other thing – there’s a lot of blogging systems and we’re like, “Do people really need another one?” We think there are reasons for us to build it and we thing people would like it, and it’s the system we want to use. But maybe it’s not, and maybe if we spend six months to a year building this, we’ll launch it and no one will use it, and no one would pay for it, which is always the risk with software. Now, crowdfunding’s around and it’s getting more popular by the day. It seems like a great way to validate your product ideas, get people onboard and excited about the product before it’s even launched and help fund the development of it. I would say, for anyone who’s building software on Mac or iOS, to look at crowdfunding. But I will say it is very hard to raise money for software on the crowdfunding sites, because most people have physical products, but it’s not impossible because we obviously did that and I’ve seen quite a few other software products do it. I would look at that as a viable option. As a pre-launch, it’s a way to build hype and get people onboard from day one and validate your idea. Alexis: If I could steal another minute or two of your time, are there any highlights in terms of what people should do or not do for a Kickstarter or an Indiegogo campaign? Dan: Yes, there are. I have a draft post. Alexis: Oh, we’re getting a preview! Dan: Because I wanted to cover the whole campaign, it’s turning into a bit of a mammoth. Dan: Yes, because I wanted to be completely transparent about how we set up the revenue and everything – all the stuff behind it. Setting up a campaign, Kickstarter and Indiegogo both have really good guides on how to go about setting up a campaign. Both of them are well worth the read, but I think one of the most important things is doing a video and explaining why you’re building something and what it does, why it would benefit the user, and just put a human face to it and make sure you do a video. We did a lot of research, and a lot of the campaigns that had very little backing were pretty shoddy and very quickly put together and you could tell that, and they had no video, and all the description was pretty sparse. We spent a long time fleshing out all the description, getting lots of images in there, explaining the product, the benefits and obviously producing a video for it. I think that all really helped. Alexis: Alright. So if folks would like to learn more about Realmac and its projects, where should they go? Dan: Realmacsoftware.com, and you can follow us on Twitter @realmacsoftware. If you want my personal site, it’s dancounsell.com and you can follow me on Twitter @dancounsell as well. Alexis: Alright! Man, you are good. You said that you weren’t very used to podcasting, but usually I have to stop and ask people “How about your personal Twitter account?” [Chuckling] But man, you’re a pro! Dan: [Chuckles] It’s the marketing side of things. I’m just used to making sure you mention everything. Alexis: And for us – now to do the marketing thing on our side – you can follow us @Binpress and myself, @alexissantos. Man, thank you for putting up with me clearing my throat for an hour [chuckles]. Dan: No, it’s been awesome, thank you. The time has flown by. Alexis: Alright. And for the listeners, we’ll catch you next week!